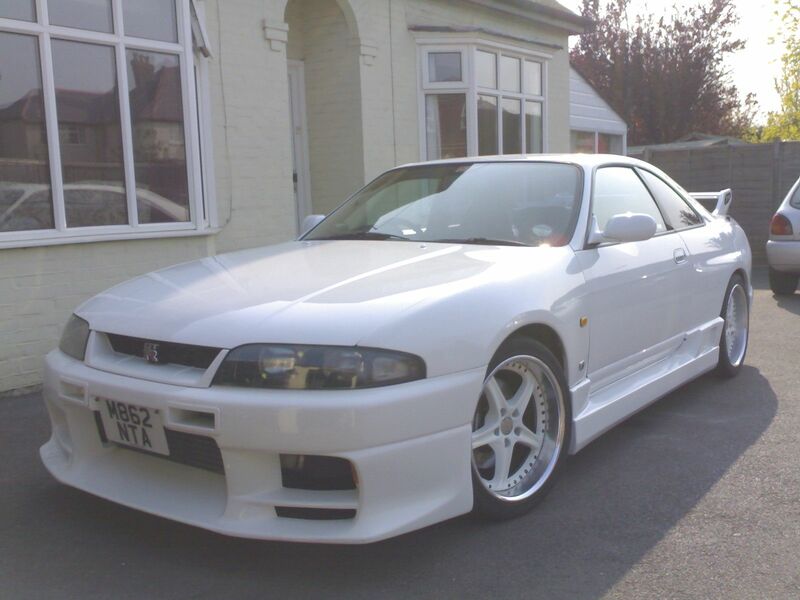 I had finally realised my dream of owning a Skyline GTR! I was grinning from ear to ear driving it back home as well as being incredibly nervous about getting back in one piece! I was well aware the car had been sat for a while and the auxiliary belts certainly didn’t look in good shape. The thought in the back of my head was whether the cam belt was also in bad shape. Needless to say I took it very gently home. Even in its current state with bits of bodywork held together with duck tape and half hanging off the rumble of the straight 6 was turning heads where ever I went. Also despite being a bit grubby the brilliant white colour was very eye-catching. 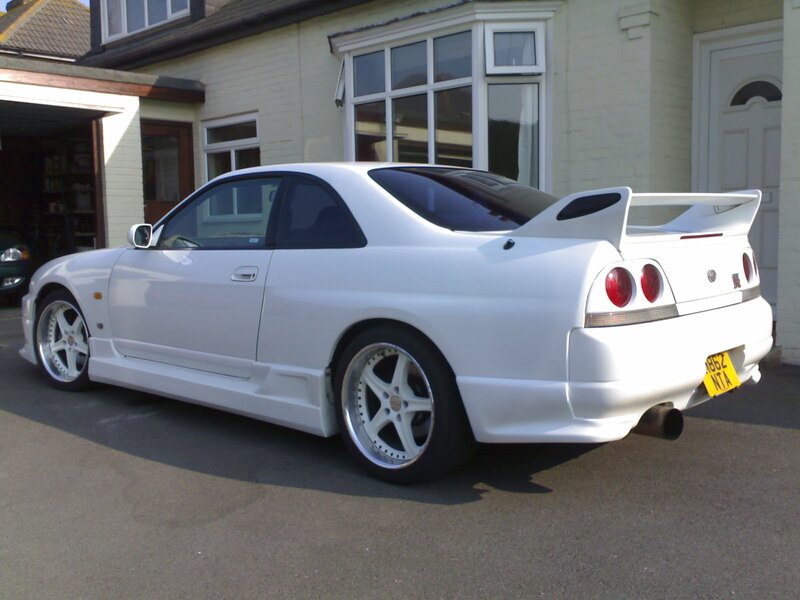 I never thought for a second I would have a white GTR but the colour worked! As you can seen in the pictures the car was generally there and just needed a little attention to return it to its former glory. First job though was get some new belts on order and get them all swapped over for piece of mind! I set about removal of the front and rear bumpers for repair and the side skirts turned out to also need some light repairs and correct fitting. The wheels were also a little sorry for themselves and would need a bit of a refurb.. Mainly just flaking paint and lacquer. 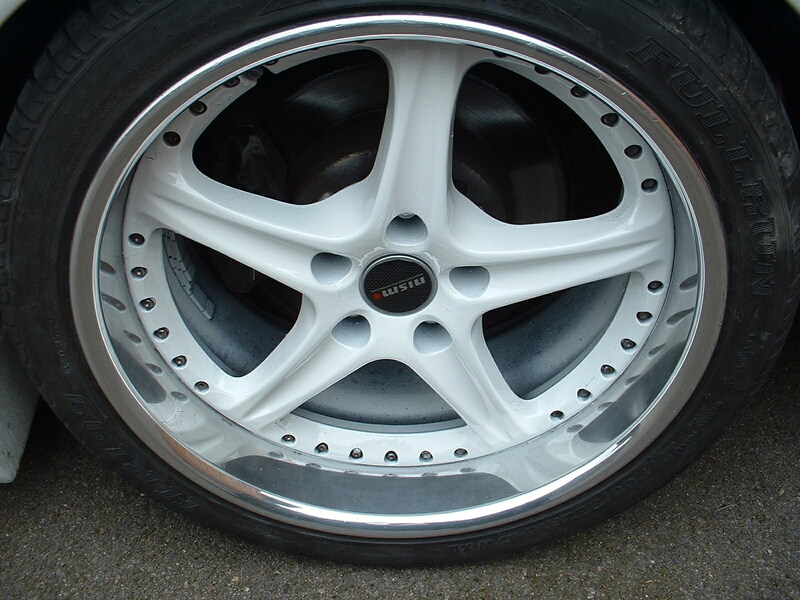 The actual rims were in good condition and were, as I found out, a rare set of SSR Evolutions. 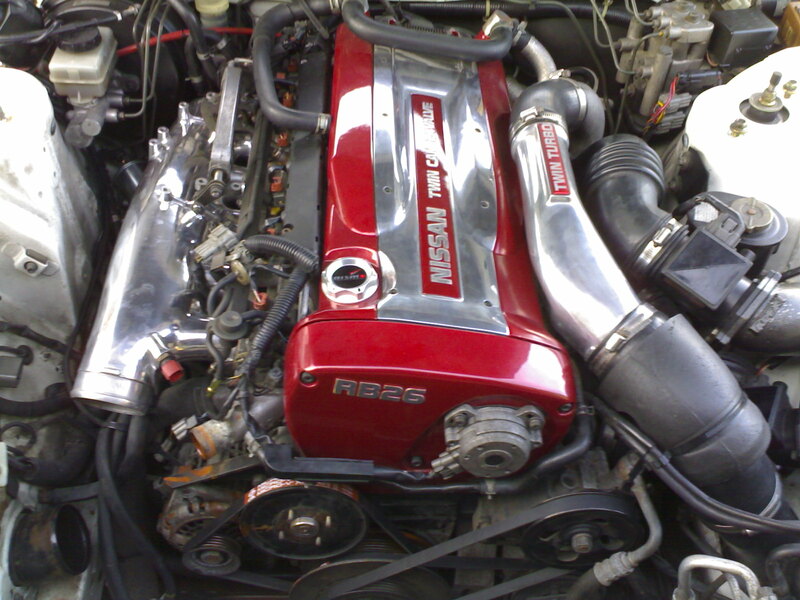 One of the main areas where the car needed attention was the engine bay though! As well as a good service and once over the typical flaking paint on the cam covers and inlet manifold had left it looking very manky. All this would have to come off for a tart up. The car certainly came with a few goodies on it asides from what has already been mentioned. Adjustable Tein suspension, Apexi induction, HKS dump valves an Arc Front mount intercooler, BeeR Limiter and 4WD Torque Split controller. 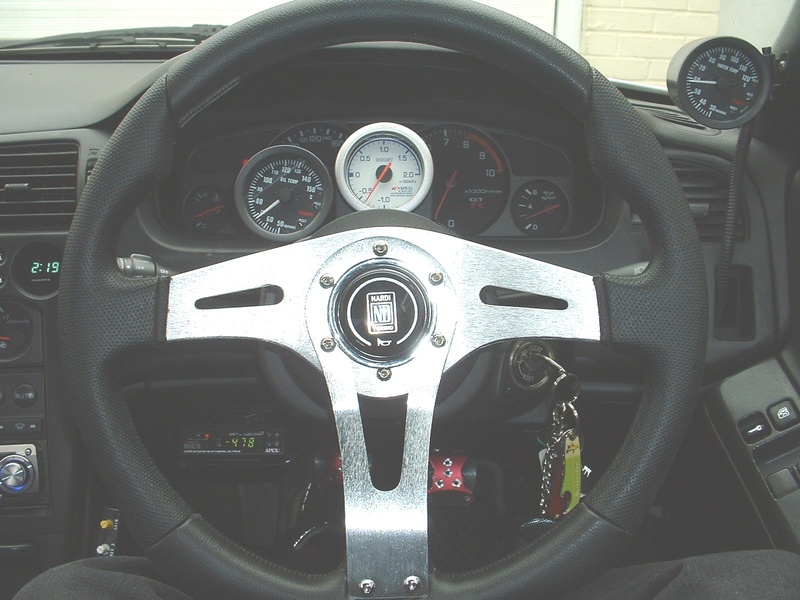 The interior had also been added to with a Nardi steering wheel and half leather Recaro seats from a Supra which were nicely hugging. On top of all the cosmetics I was keen to maximise the power output at a minimal cost. I did my research and figured as a near standard car running factory boost and turbo’s I was probably getting around 350-370bhp? I couldn’t afford to get too carried away so made a plan to get an apexi ECU, and decent boost controller. The car had also been decatted by the previous owner so I invested in a CAT for MOT! The body work quickly took shape once it was off. 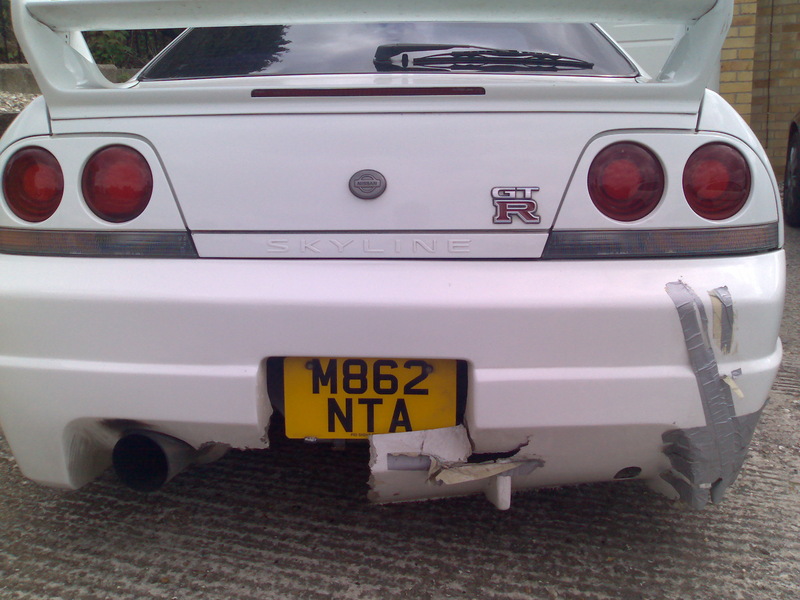 Sadly the rear bumper could not be salvaged as it was too badly damaged and too much of it was missing. So I replaced this with a standard bumper and some spats instead. I also had to remove the driverside wing and repair the lower corner covered by the side skirt. It appeared the wing had been push back and distorted slightly when the front bumper had been damaged. 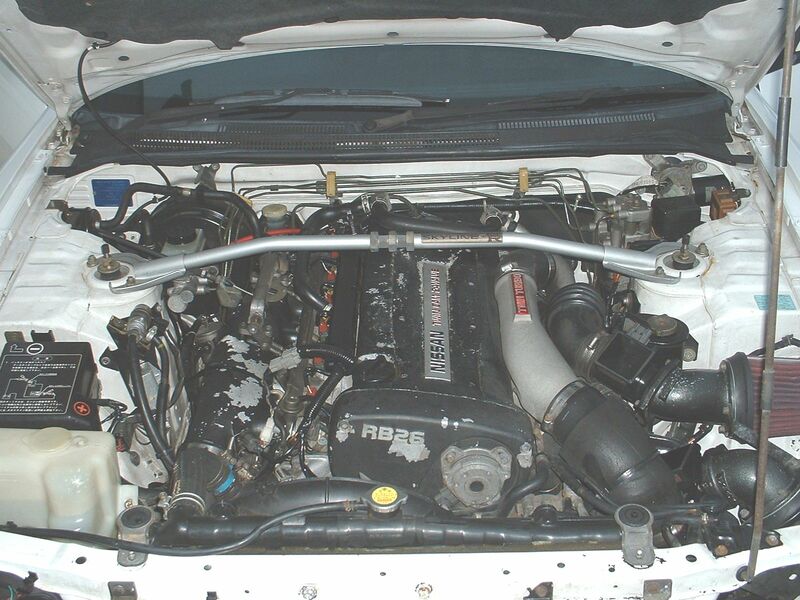 The engine I did in a couple of stages. First of all I stripped and painted all the covers and polished the turbo pipes myself. I then bought a spare inlet manifold that had already been polished and drummed in the help of a local skyline mechanic to help do the manifold swap while doing the timing belt and giving it a once over. There is a maze of pipes and connections under the manifold and not being able to see them with the motor in the bay I was not happy to attempt it myself with fear of breaking something! To add some final finishing touches to it I also repainted the old strut brace and brackets in the engine bay to brighten it up slighty. I then had some new stickers made for the strut brace and coil cover badge, which I used to replace the standard badge with a carbon plaque that I made at work. End result was a shiny bling new engine bay! 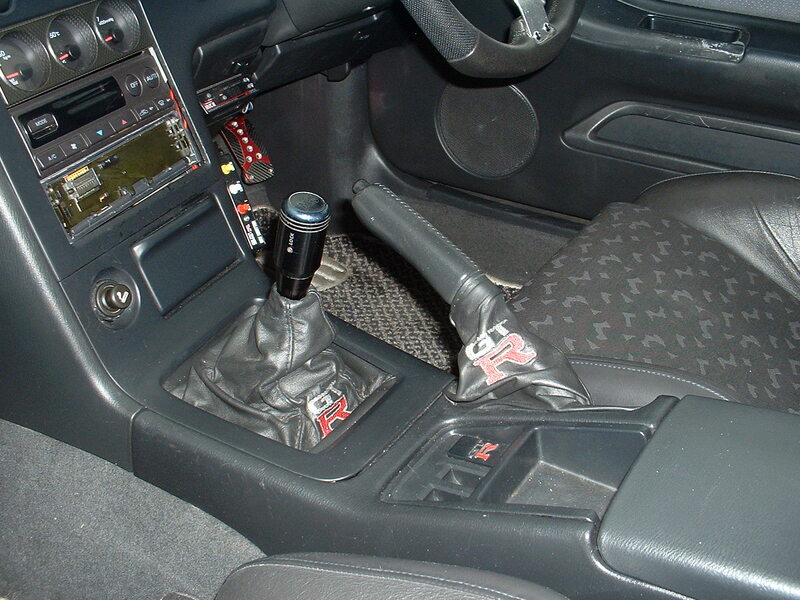 GTR handbrake and gear gaiters. Just helped to break up the black interior a bit in my opinion and add some subtle little niceties to it! After this the only cosmetics left to do were the wheels which were looking quite sorry for themselves. 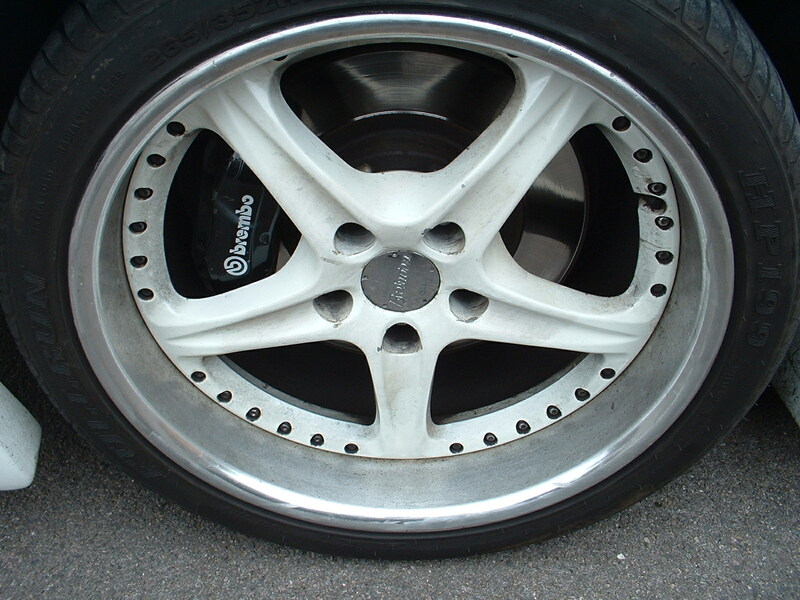 Rather than break them right down as they were split rims. I decided to strip them back by hand. Which was quite a painful job! Mainly the clear lacquer on the lips was impossible to get off and had to be sanded back. Once this was off the lips were flatted with wet ‘n’ dry back through the grades to 2000grit to prepare them for polishing.I then invested in a polishing kit and some good aluminium polish and in a couple of hours the lips were up to a mirror finish. I would recommend either Autosol and Belgom Alu for all your metal polishing needs! I decided to leave the lips bare after talking to a polishing guy as this would allow easy maintenance if they did dull down over time. The lips were then masked off and the spokes were primed and painted in arctic white to match the bodywork. This replaced the original pearl white colour which constantly looked dirty against the brilliant white of the bodywork. Sadly one of the original wheel centre caps was missing from the set and I could not find anywhere to get these. Instead I found some blank centre caps and got some carbon GTR badges which I bonded to them to finish the rims off! The car was a picture! With the car looking the part it was now time to extract a little more performance from it. 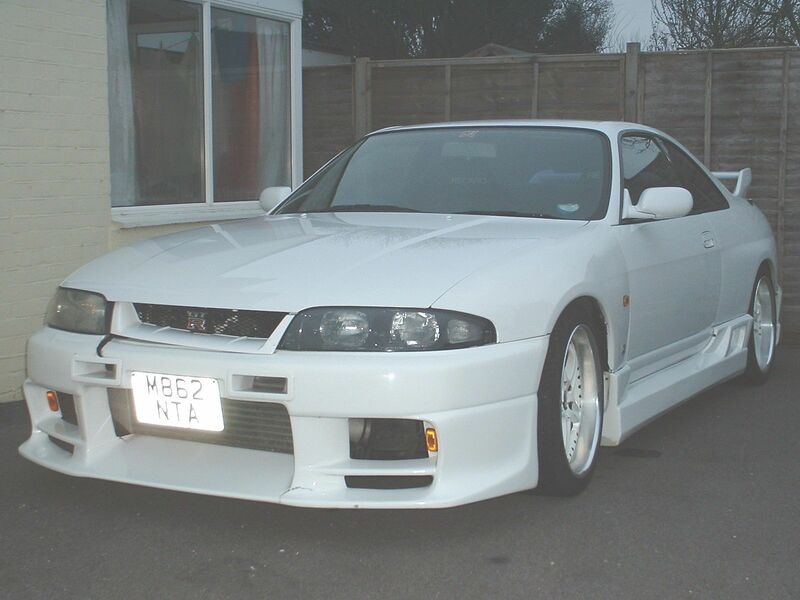 I must say though in its current state at an estimated 370bhp it was certainly the fastest car I had own. It also felt the safest. The FWD was something new to me and was out of this world. You really had to try to break traction with this car and it went where ever you pointed! I had by now found a good second-hand Apexi ECU to fit to the car and also a decent boost controller. 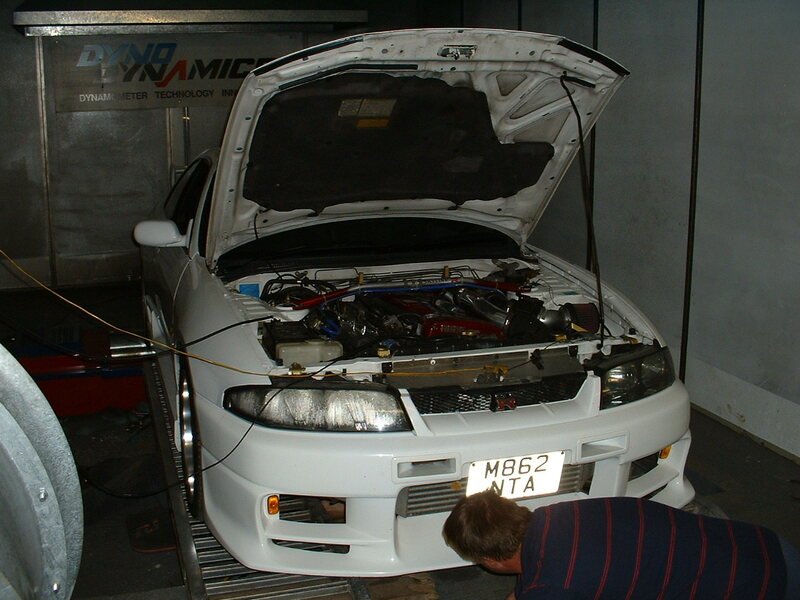 As tuning a turbo car was still relatively new to me I again asked the help of the local chap to fit the boost controller and set it up with me. The boost controller is fitted just to the bottom left of the steering wheel. (see left)(Any die harders might notice that is not a Nardi wheel as I ended up replacing it due to wear. But I kept the horn button!) You can also see the other gauges fitted around the steering column and A-Pillar for monitoring the engine temp. The factory ones are renowned for being unreliable. With that all fitted in I was ready to book the car in for a remap! After a bit of forum research and the fact they were quite local to me I chose Rising sun Performance. I took a steady drive over to Rising Sun excited and also very nervous about my re-map. Upon arrival the guys at Rising Sun set about preparing the car for its dyno run and giving it a once over. I have to say a day at the dyno is stomach churning! Listening to your pride and joy being revved to red line in a confined space! But then at the same time it is a major buzz watching the readout go up and up with every run! An initial run was done with the stock ECU setup for comparison later. 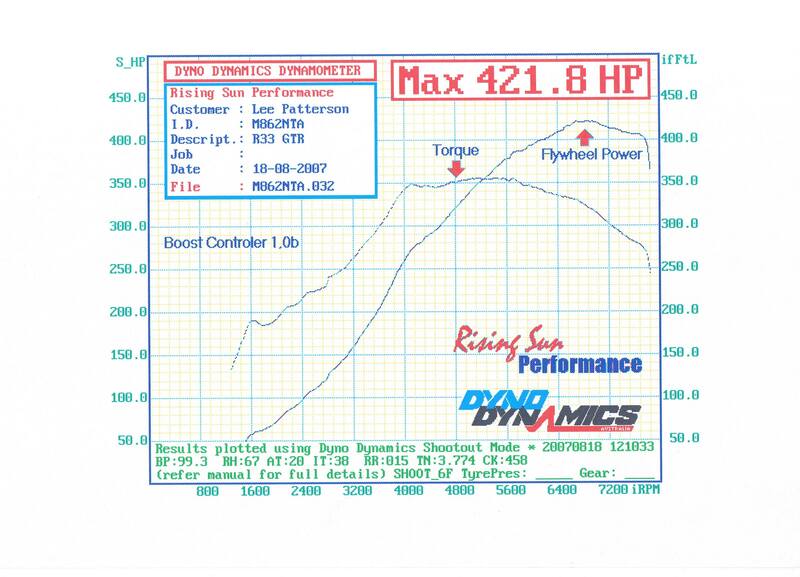 As suspected at the factory boost setting of 0.75bar the car was making about 370bhp flywheel power. 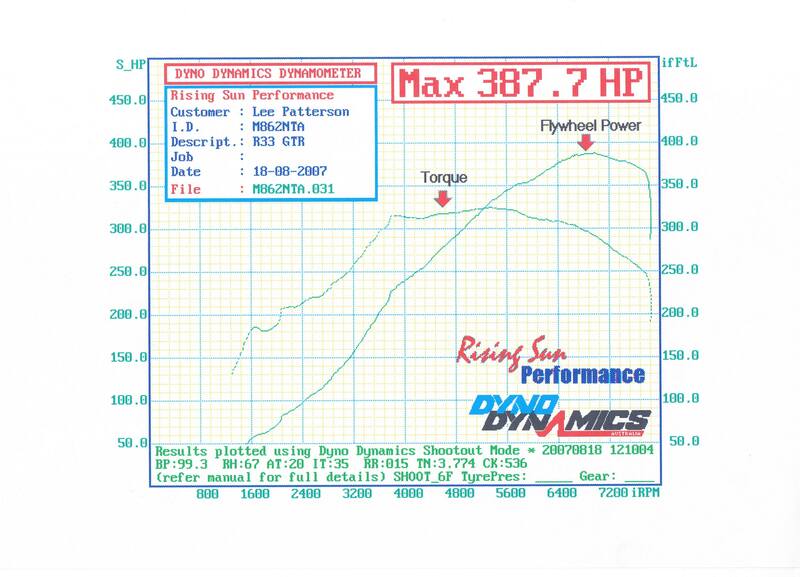 The Apexi ECU was then fitted and run with an initial low setting of 0.8 bar as a base map making just short of 388bhp. After some tweaks up to 1.0bar on the boost we were pushing out 421bhp which I was very pleased with! 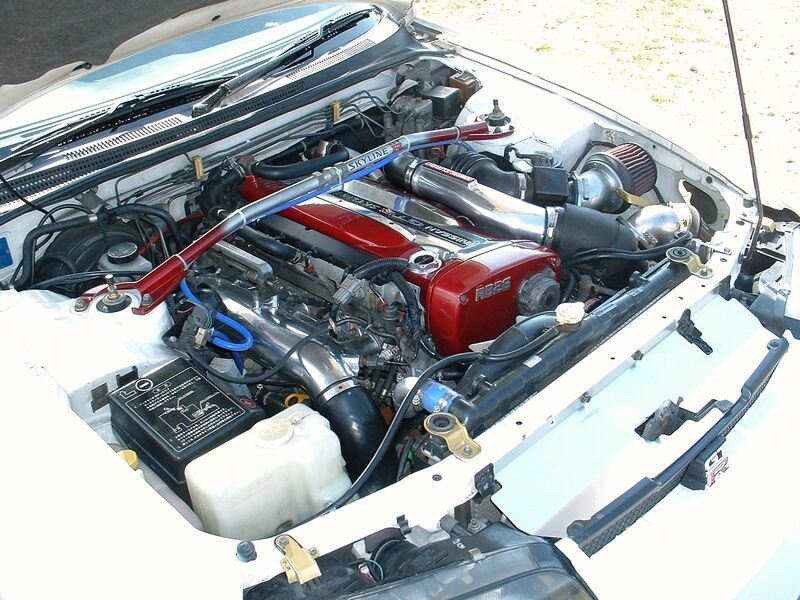 For an RB26 I was still only at a mild stage of tuning but I was more than happy with this for now. I could start going and planning something bigger now! 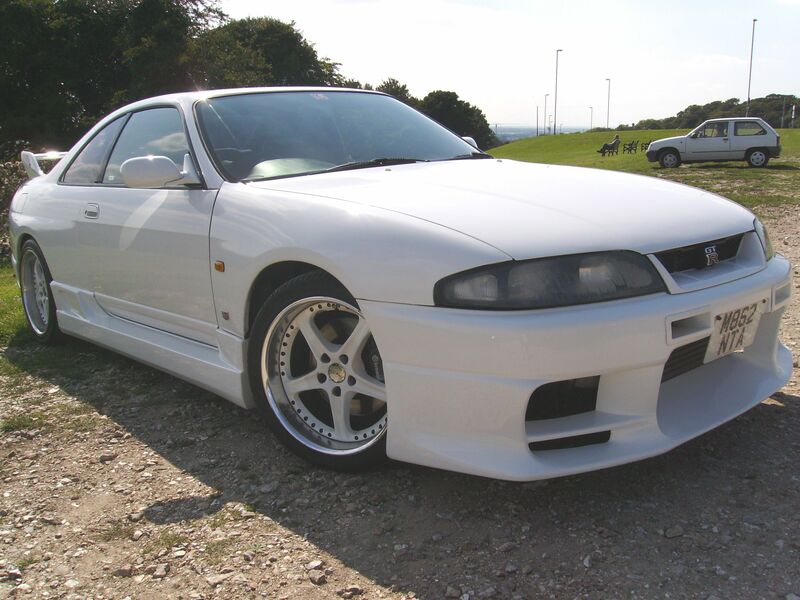 In the end I had to move on to something else and I was only going to be able to fund this by selling my beloved skyline. I had to think long and hard about it but there was no other way.. It was time for a change! After a short period of time advertising it the skyline found its new home in Germany! This was undoubtedly the best car I had ever owned and lived up to expectation 110%. I still regret selling it but onwards and upwards as they say!